Don't buy into the from producer of Insidious and The Purge thing, that is to mislead you. Ladies and Gentlemen, I am writing this review for the sole purpose to warn you about it and save yourself a waste of time. This movie is not just bad, it's beyond bad. It has only one redeeming factor which is lead Sarah Snook who I know from Predestination. In my previous review I discussed Penthouse North. Of that movie was being said it was generic and had no surprises in the form of twists and turns. Then I went into a little rant how very often in thrillers and horrors rely too much upon a twist but don't know how to build up to it. Which completely destroys the effect of that twist. Penthouse North might not have the twists but it sure was filled with suspense and tension. 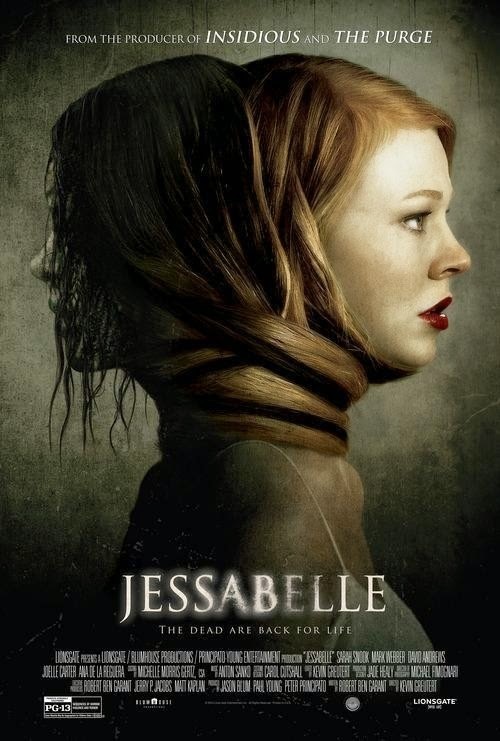 Jessabelle has none of that. There are enough sequences that try real hard to convince us this is a horror movie but fail miserably because the director has no clue how to build up tension and atmosphere. It never gets creepy or scary. Because you know the focus is on this supposed mystery. And I must admit for a little while I was intrigued. But soon things started happening that kinda gave it away that I was watching a very bad movie. I only managed to enjoy it because I was in delightful company and it gave me the chance to destroy this film by making fun of the movie. That is the only way you are going to enjoy this Jessabelle. I can't wait for the comedians of Mystery Science Theater 3000 to Rifftrax this. But you don't have to wait for them to do it. Watch this one with some friends and then just let the movie have it because it really deserves to be made fun of. Wow, aren't you a little harsh Chrichton? No, I am being kind. This movie robbed me of (very precious) 90 minutes of my life which BTW seemed like it was taking forever. After 45 minutes I stopped caring and at around 1 hour and 15 min. I was so exhausted that I just wanted the film to be over already. Like I said if I weren't in good company I would have cursed this film. I would burn it on dvd. Take the DVD, burn the DVD, I would then chop it into little pieces. Burn it again, let some random dog in the neighborhood pee on it, then try to burn everything again. And just wait for it to be gone. But why would you sacrifice a perfectly working DVD burnable disc? That is to illustrate how much I despise this film. OMG is this really that bad? Yes, it is! Stay clear from this one.